The Worcester Regional Chamber of Commerce has asked for our help. Recently I visited there to ask how we could work together. After all, we both represent businesses sharing the same city. I was greeted by Tim Murray, Executive Director, and Stu Loosemore, Director of Government Affairs and Public Policy. The issue that came to the forefront was Worcester’s dual real estate tax, in which commercial and industrial properties are taxed at a rate higher than residential properties. Landlords straddle both worlds. 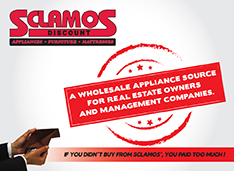 We operate businesses that may be classified as either residential properties or as commercial, depending on the number of units in the building. Could we help them to make a case for a lower commercial rate? The City of Worcester sets its budget each spring for the fiscal year starting July 1. The budget calls for approximately $500 million in expenditures. According to the Worcester Research Bureau, approximately half of this will come from state funds. The balance, $250 million, comes mostly from local real estate taxes. Once this budget is set, the city council votes to apportion the tax levy between residential and commercial properties. If both types of properties paid the same single rate, the tax rate would be easy to calculate: $250 million in taxes divided by the assessed value of all the property in the city = the tax rate. For fiscal year 2015 (which uses data as of January 1, 2014), there will be roughly $11 billion of property in the city. An approximate single rate would be $250 million divided by $11 billion = 2.2%. We all talk about this tax as $22 per $1000 in assessed value. 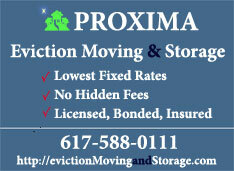 A law in Massachusetts was passed to allow Worcester city council and others the ability to charge dual rates. Businesses can be charged more than 2.2%, and residential properties can be charged less. The law places restrictions on how much the burden can be shifted. 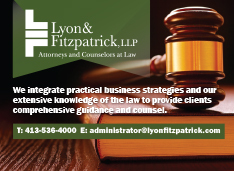 The law defines a “minimum residential tax rate” or “lowest possible residential tax rate” in terms of how much of the burden can be pushed onto the commercial and industrial properties. All businesses combined can be made to pay 10% more than they would under a single rate system, or 50%, or sometimes 75% more. The law is very complicated. Worcester is currently stopped at 50%. City officials call this shift the “commercial, industrial, and personal property factor,” or CIP Factor. A CIP factor of 1.75 means businesses will pay 75% more total tax than they would under a single rate system. Worcester’s maximum CIP factor is 1.5. Given that the city can shift 1.5 times the normal commercial tax onto businesses, they can do some math to figure out who pays what. We’ll look at this year’s proposals in a minute. The first time Worcester charged a dual rate was in 1984. At that time, 35% of the assessed value was business. Since then, this ratio has declined slowly to 23%, a loss of 1.5% per year. We tried to tie this loss of business to the dual tax rate in a scientific way. This is not easy to do. No one with whom we spoke tracks city-specific economic activity. We asked the Worcester Historical Society, the Worcester Research Bureau, the Commonwealth of Massachusetts State Archive, the Boston Public Library, and the United States Bureau of Economic Analysis. The BEA came closest. They track gross domestic product for a region that stretches out from Worcester north to New Hampshire and south into Connecticut. All of the municipalities in the BEA region have different local tax rates, so the GDP for this region is not helpful. The Chamber shared with us several anecdotes that suggest businesses have a hard time locating to Worcester. One such story was of a businessman looking for office space in either Worcester or Shrewsbury. He found two essentially identical spaces on opposite sides of Lake Quinsagamond, which marks the border between these two towns. The businessman chose Shrewsbury because he would save enough in real estate taxes to hire another employee. The only difference in the two towns was the tax rate. The City of Worcester has other disadvantages for new businesses. The one that seemed most significant to us, when it was described, was the “water and sewer hookup fee.” Even if the pipes don’t change, new subdivisions within a building require a water and sewer hookup fee. In one case this was $25,000. Out of 334 towns in the Commonwealth, Worcester’s commercial rates are in the top 10%. Other high rate cities include Pittsfield, Holyoke, Springfield, West Springfield, Lowell, Lawrence, Brockton, Taunton, New Bedford, and Boston. With the exception of Boston, these are places that the Commonwealth has said need help of some sort. They’re labeled “gateway cities” and earmarked for special development programs. They should have plenty of business to support the local economy. They don’t. Have commercial rates driven business out of these cities? Maybe commercial rates are harmful except in Boston, which has the cachet of a seaside capital city. 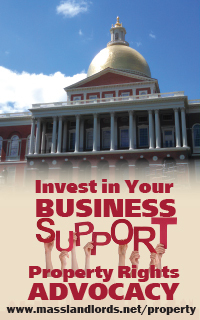 The Chamber is focused on Worcester, so we’ll zoom in there. Worcester has nine municipal neighbors. The table below shows tax rates for these communities. All but Auburn have single rate systems. What can we say about these communities? Well, it’s pretty clear that Worcester charges the highest commercial rate. Worcester’s residential rate isn’t that low, either. A building in Leicester with the same assessed value as a building in Worcester would be half as costly own. Overall, Worcester’s taxes are high. Do higher real estate taxes correlate with slower growth in economic activity? We said above we couldn’t find that data. 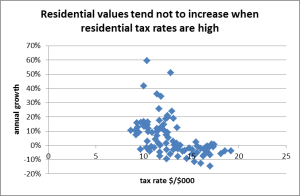 Do higher real estate taxes correlate with slower growth in building values? The Massachusetts Department of revenue made available tax data and assessments for Worcester and surrounding municipalities. We plotted growth in assessed value against the year’s tax rate. The vertical axis shows how much the local real estate market went up in a year. The horizontal axis shows what the tax rate was for that year. If higher tax rates were correlated with slower growth, you would see a general trend decreasing from left to right. That is what we see. In the commercial graph, the circled point is an outlier that might be excluded. This represents Worcester’s 2013 growth following 2012 tax rates. When the new City Assessor, Bill Ford, switched from Worcester’s old (inaccurate) paper assessment system, commercial rates were found to be sharply below market, oftentimes because of temporary abatements that had never been removed. 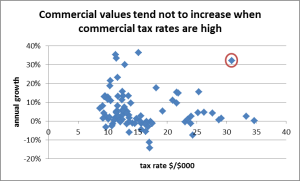 Commercial values increased sharply despite higher taxes in this year. That increase in assessed value was not the result of market activity. Each graph uses the growth in assessed value for the year in which that rate was in effect. This is different from how city officials think about it. When city officials talk about “growth in assessed values for Fiscal Year 2015,” they mean growth for the prior year. They use this figure to understand why they must increase or decrease real estate taxes in order to make the budget ends meet. We’re looking at the actual growth following the setting of tax rates, not the fiscal year growth. We’re trying to look at the effect and not the cause. Are lower taxes a guarantee of growth? No. Many data points show that low tax rates sometimes correlate with zero or negative growth, especially in the 2008 to 2009 timeframe. Since it’s so difficult to know for sure what the right answer is, businesses (represented by the Chamber) and homeowners (represented by neighborhood groups) have taken opposite sides of the issue. 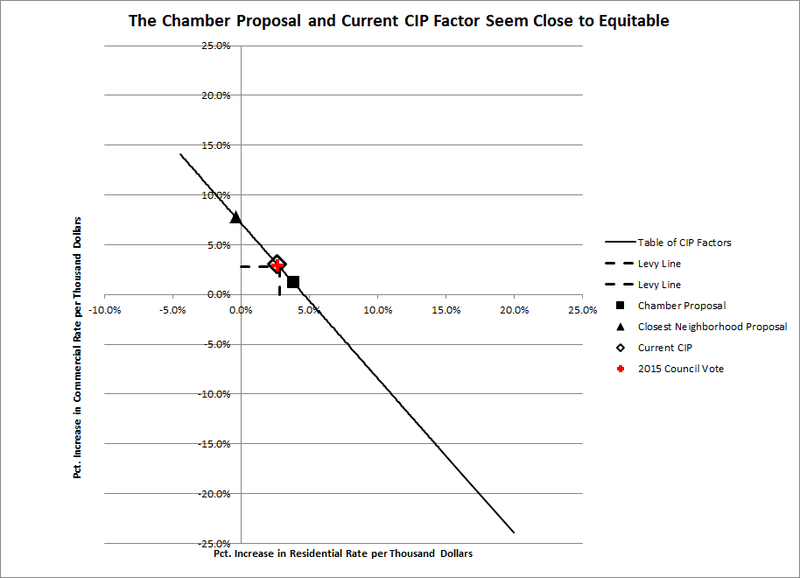 The Chamber has asked for a Fiscal Year 2015 CIP Factor of 1.3310 (a decrease from last year’s CIP factor of 1.3556). The Shrewsbury St. Neighborhood Association and the AWARE Coalition have asked for a Fiscal Year 2015 CIP Factor of between 1.4179 and 1.5002 (an increase). The Chamber and the Neighborhood Association have been in talks. Stu Loosemore at the Chamber said they were not able to agree on a compromise, something they had done in past years. How should City Council decide? In Fiscal Year 2015, the City of Worcester needs an additional 4% more from tax levies than in 2014. The assessed values of properties haven’t changed (on average). This means that everyone should expect a tax increase in FY 2015. Under a single rate, this increase would be 4%, plus or minus any change from a change in assessed value. Among other things, the city council looks at the impact on the median bill. The “median bill” is the one where half the payers pay more, and half pay less. Under the Chamber’s plan, the median residential bill would rise 4%. The median commercial bill would rise 2%. Under the neighborhood group’s plan, the median residential bill would remain the same or decrease, and the median commercial bill would rise 8% or higher. City Assessor Bill Ford told us that small changes in assessed value have resulted in relatively large increases in average bills for condos, two units, and three units. He’s checking the math just to make sure. The point is, if we hold the CIP factor at the same point from last year, many small landlords will pay on average 10% more in taxes this year. 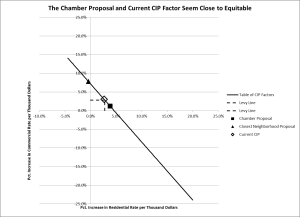 The effect of the Chamber of Commerce move toward lower CIP factor is a 1% increase. Most of Fiscal Year 2015’s change comes from changes in assessed value. Only 1% comes from lowering the commercial rate. Without a measure of local GDP, it will be hard for anyone to state that lower commercial taxes are better for the city. This lands us in an ideological quagmire. Either you’re pro-business or you think businesses are “the bad guys” or “the rich guys” and deserve to pay more. Landlords in Worcester and other dual rate communities often straddle both worlds. Properties with more than four units are zoned commercial and subject right away to higher commercial rates. (Correction: in Worcester, all residential properties are taxed at the residential rate, regardless of unit count.) Properties with four units or less are zoned residential and benefit from a CIP shift. You could be excused for picking one side or another based on your personal portfolio. The nice thing about landlording, however, is that you can pass through real estate tax increases in the form of higher rents. As long as these increases are reasonable. What’s reasonable? Real estate taxes represent something like 10% to 20% of monthly gross revenue. (You can do the math a variety of ways. This range figure comes from assuming you pay 2% to 4% of assessed value per year, and your property has a cap rate of around 10%.) If real estate taxes increase 10%, that requires an increase in gross rents of 2% in a year. That’s manageable. Many leases (including ours) also have real estate tax escalation clauses that let you pass these increases through to tenants immediately. I tend to want lower residential taxes (agree to strongly agree). I tend to want lower commercial taxes (neutral to agree). 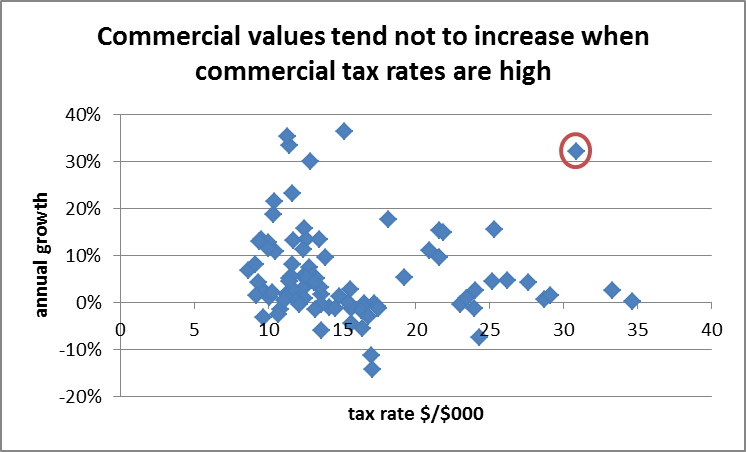 When commercial taxes are higher than residential taxes it tends to hurt the local economy (neutral to agree). I know about tax escalation clauses in rental agreements (strongly disagree to strongly agree). We can do a better job educating our members about tax escalation clauses. That’s one way in which landlords are protected from any tax increase. Ideologically, landlords would seem likely to support both the Shrewsbury St position of lower residential taxes and the Chamber of Commerce position of lower commercial taxes. All landlords will be disappointed to learn that their taxes are going up 10% this year, no matter which side prevails. Probably many of them would support an additional 1% if it meant Worcester’s local economy would be healthier. No one likes tax increases. Given that the city of Worcester requires them, which scheme most closely shares the load? The chart below shows the percent change in commercial rates vs the percent change in residential rates for all possible CIP shifts. The dashed box represents that portion of the FY 2015 levy due to tax increases (as opposed to assessment increases). The hollow diamond shows the current CIP factor. The Chamber Proposal is the solid square. The Neighborhood Association has proposed a range of CIP factors, the one closest to the center of the line shown as the solid triangle. 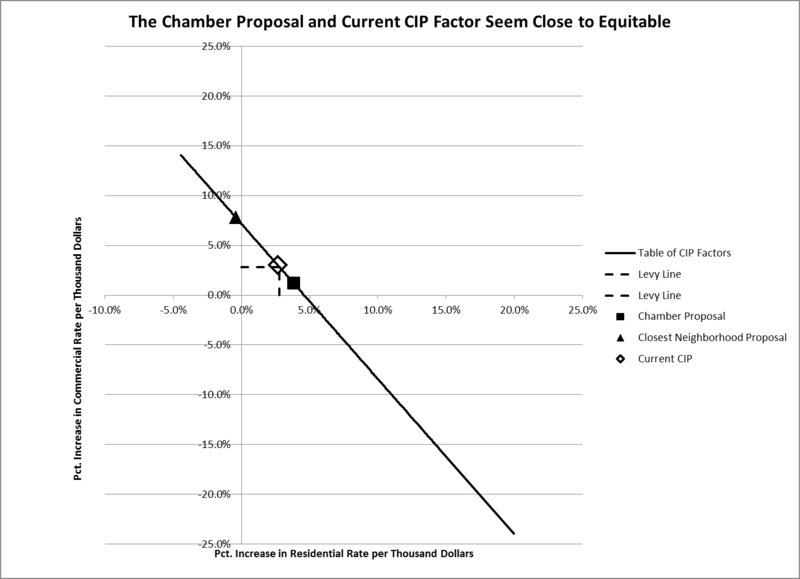 If the percent increase were to be distributed evenly, the current CIP factor should be sustained. The Chamber proposal also seems reasonable. The Neighborhood Association proposal seems unreasonable. As stated above, if the total levy is to increase this year, residential properties should pay some sort of tax increase. These figures consider only rates. Some owners, like landlords, are facing large tax increases no matter what. Since 1984, the first time businesses in Worcester started paying more than their fair share of tax, Worcester has shifted away from 35% business to 23% business. This amounts to a loss of one-third of the business value in the city. Last year Worcester had the highest commercial rate and the second highest residential rate of any of the surrounding municipalities. Higher tax rates tend to slow growth in assessed values, damping the local market. All of the plans worth serious consideration for Fiscal Year 2015 require higher taxes. Landlords in particular should expect to pay ~10% more in taxes under all but the most extreme CIP changes. 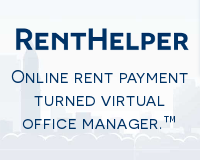 A 10% increase in taxes on a three unit can be paid for with a 2% overall increase in rents. The Chamber’s proposed change accounts for only 1% of the increase in two and three unit tax bills. The majority of landlords want lower taxes. The current CIP factor is closest to an equitable increase in percent rates; the Chamber CIP factor is second closest. 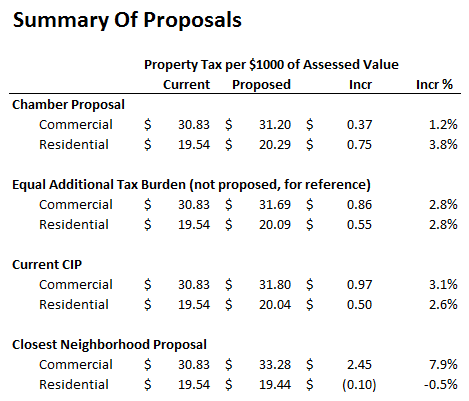 Summary of Worcester, MA FY 2015 CIP factor proposals. We asked why Worcester landlords were facing about a 10% increase on their taxes for two and three units when this year’s tax levy had increased by only 4.4%. Apparently, it wasn’t assessments. The 10% figure came from a comparison to two years ago. Other tax data used in this article remain the same following the December 2 update. The Worcester City Council picked a point that essentially holds the line between residential and commercial rates. Graph shows the range of possibilities, with the City Council vote in red (little or no CIP factor change from last year). In future years with less opposition from the neighborhood group and/or increases in assessed commercial value, we may see continued movement toward a single rate. We’re wondering if the Chamber of Commerce is disappointed, not having gone as far as they wanted toward single rate. But the 2015 rates do show essentially that the city has held the line against slipping back towards past years’ disparities, against which the Chamber has done so much. The extra charges of a government on the purchasing of property for small business startup in the form of general country tax can be eliminate by using accounting tips easily with in a seven days according to the rules and regulations of a government,If you write an application with the authentic reasons for a elimination of property tax and also attached a legal documents of a property tax pairs after that submitted in the government office by the tax layers which is helpful for you to approved the claim of your property tax in the seven days without any allegations of a government on the application of your property tax ,Remember don’t write any irreverent reasons in the applications of property tax you want to submit in the office of government and also don’t attached any illegal or extra document of property which increase the chances to refuse or neglect your claim application ,So keep it in your mind all the instructions and requirements given to you by the tax layer after concerning this kind of matter according to the current policy of government .